Photo courtesy of Kempinski Hotels. Stephen Covey is the author of many life-changing practical books on reinventing yourself to be the best you can be. My favourite is First Things First In this he writes that blinding flash of the obvious: ‘The first thing is to make the first thing, the first thing’. 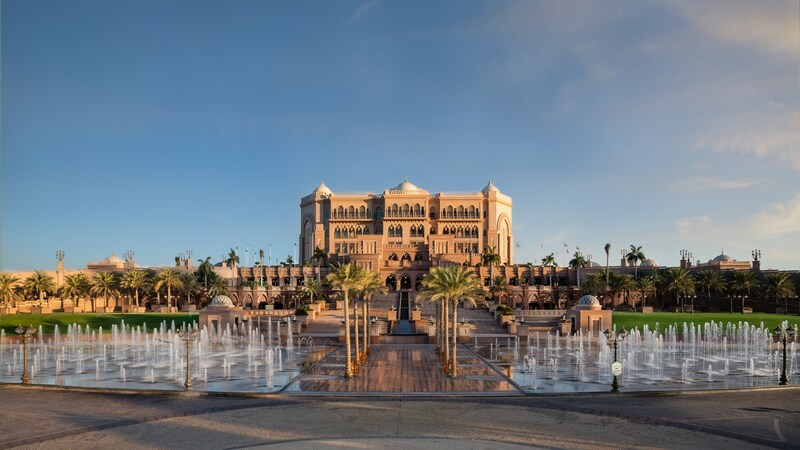 The Emirates Palace is a living testament to this philosophy expressed by Stephen Covey, for so lived the amazingly creative thinker, Sheikh Zayed bin Sultan Al Nahyan, Emir (Prince) and Hakim (Ruler) of Abu Dhabi and Rais (President) of the United Arab Emirates. 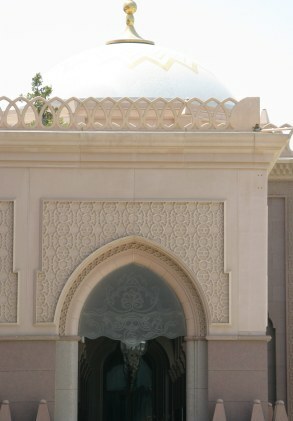 Sheikh Zayed ruled Abu Dhabi over almost 40 years during which it was transformed – under his foresight. An encampment around a lone fort has been carefully developed to an amazing, tree-lined city. Abu Dhabi has a diversified economic base designed to successfully – and grandly – survive beyond the eventual end of the current oil and gas reserves on which the nation’s immediate excessive wealth is based. The beautiful Sheikh Zayed Grand Mosque may be Sheik Zayed's most sacred legacy – but The Emirates Palace Hotel is perhaps the most magnificent secular one. 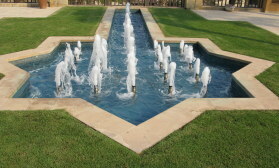 Emirates Palace is surrounded by 85 hectares (about 210 acres) of organic, landscaped gardens, and fountains. These are an important refuge for wildlife and birds, both native and migratory. The sound of so much water is an anomoly. Abu Dhabi sits on the fringe of the Rub' al Khali desert - known to the Bedouin as The Empty Quarter, the largest contiguous sand desert in the world. 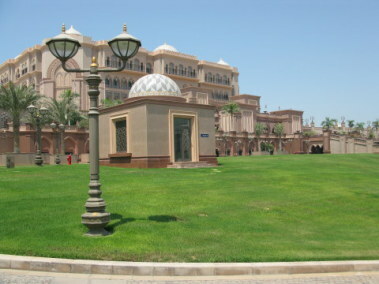 The grandiose structure of the Emirates Palace was designed to be an icon of the Emirate - and to place Abu Dhabi at the centre of Emirate politics. 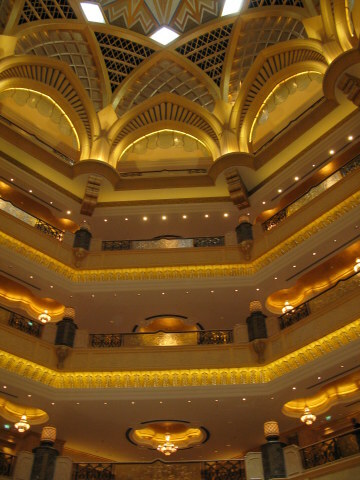 Although it is a luxury hotel operated by the famous Kempinski Hotel Group, the Emirates Palace Hotel is much more than a hotel. 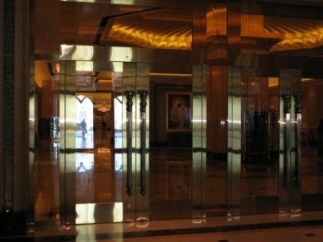 It was also specifically designed to provide sumptuous accommodations for visiting Heads of State. 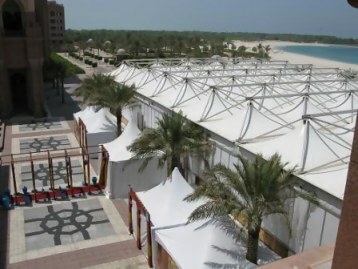 It has three floors dedicated to housing and providing the facilities necessary for conferences for the 6 member nations of the Gulf Co-operative Council and also of the 22 member nations of the Arab League. 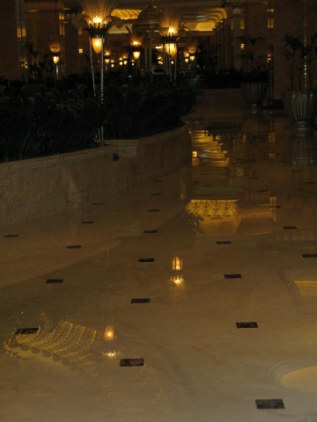 The state-of-the-art conference centre can accommodate 2,000 delegates. There is a medical centre, media centre, boutique shopping mall – the expected variety of spas, restaurants, and bars (with 128 kitchens and pantries – producing amongst other things 5kg of edible gold delicacies every day) plus a helipad and beach. 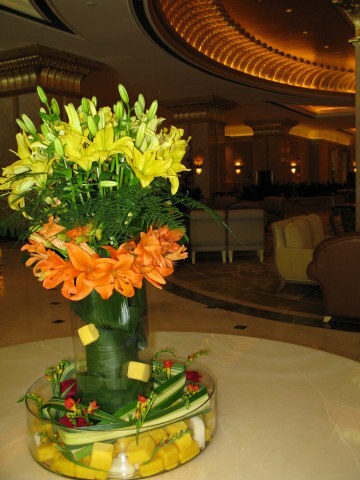 It was into this elegant luxury that I was escorted for a birthday breakfast while working in the Emirates. 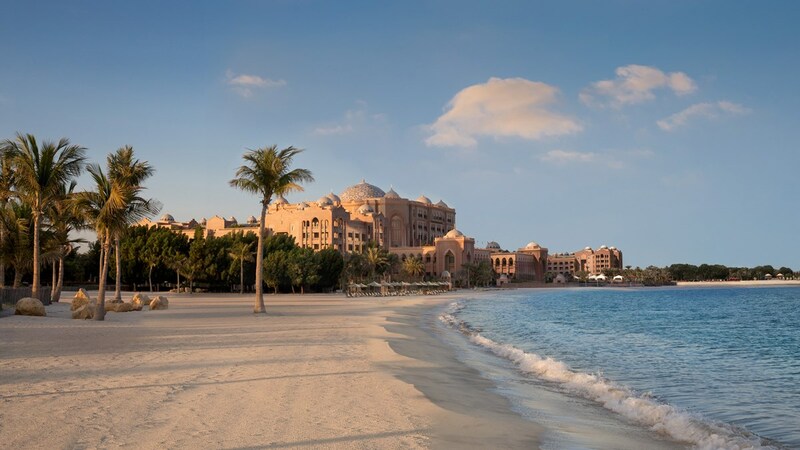 It’s possible to purchase a package for a meal, afternoon tea, or breakfast – now when the season for it opens, also an exotic beach BBQ - and I have to say that dining at the Emirates Palace is a magical way to celebrate. 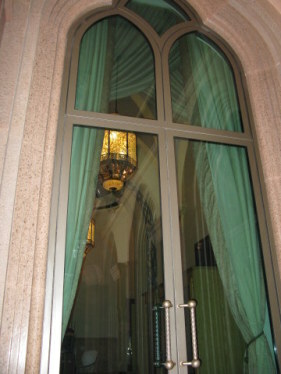 You arrive to a shady entrance, and pass through these enormous cast glass doors. 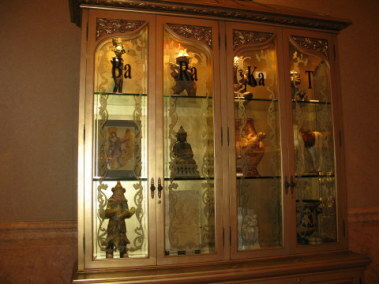 Then you walk past two of these Curio cabinets.They each weigh more than 1 tonne (about 2,205lbs) and were hand-crafted in Thailand. One dreads to think of the value of the curios inside. 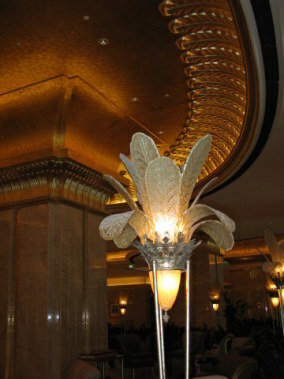 From here you find yourself in a shiny entrance, lit by art-deco-styled chandeliers and lanterns. 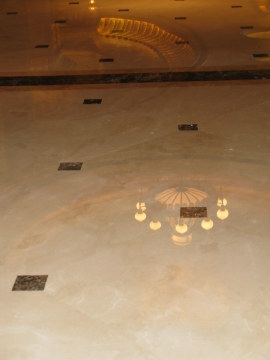 The marble floors are quite literally mirrors to the lamps above. Here, the reflections of lights above form a wonderful overlay of imagery. It was as if these reflections drew you magically onto a secret pathway you cannot but be tempted to follow. Even in the contemplative corners, beauty is reflected. 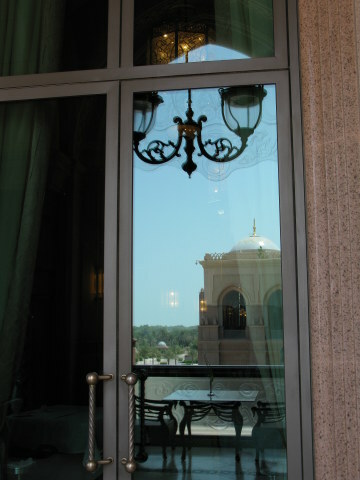 From outside on the terrace this wonderful mirage of reflected images continues as you look inwards. 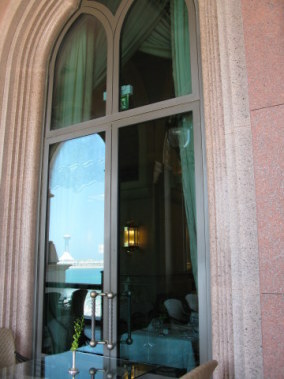 The windows reflect the building on the opposite side of the bay. 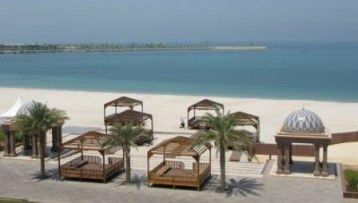 The 400km Abu Dhab coastline (249 miles) has 10 kms (6 miles) of public beaches, but here there is a beach just for guests. 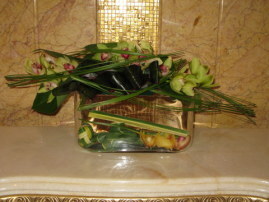 It is staffed to attend to your every need – even if that is to be left alone! 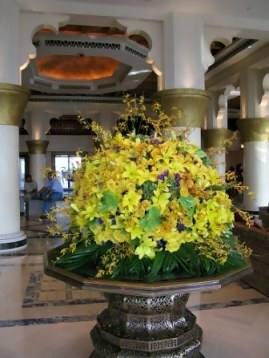 The flower displays are exceptional – even by Emirates standards - here with orchids. Those in the bars were a mixture of fruit and flowers in brilliant colours. 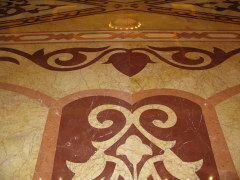 The marble used in the Emirates Palace came from 13 countries. 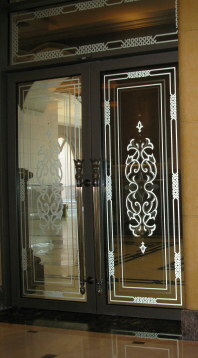 Outside is as highly polished as inside. 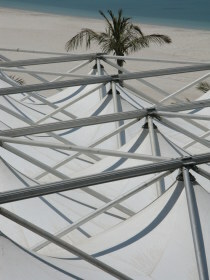 This keeps the ever present desert dust from settling on the grand structure. There are more than 113 domes, their gold plated mosaics on the filials on the top of the domes being the only gold in the entire construction (according to the architect’s overview – and contrary to urban legend). The largest central dome is one the widest spans in the world. While quite lovely and giving it cathedral-like qualities, this design is an essential feature of the cooling for the building. 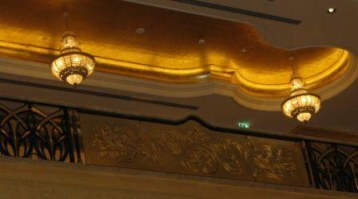 It seems like some sort of opera house towering above the entrance lobby, with the detail of each balcony like some elaborate theatre box from which to view the performance on the stage below. 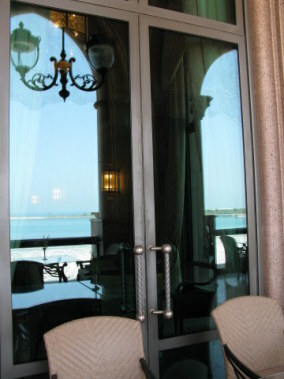 Our table looked out onto the western end of the cornice lagoon, across the private beach. Before settling to savour the sumptuous fare, we first walked around under the high arches of the verandahs, soaking in all the patterns. 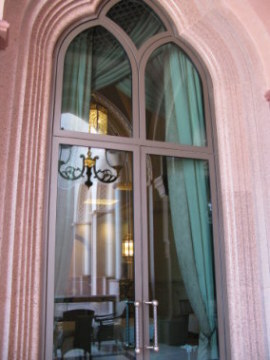 The bright turquoise of the sea made a beautiful contrast to the pink marble that framed doorways and windows. This made the inside somehow to merge with the outside to form small cameos of beauty. It was Ramadan, and we had also been following the fasting tradition along with our colleagues, but not today. While they would wait to break their fast in communal meals after the imman’s call to prayer in the evening, we devoured a delicious breakfast in our lofty restaurant. Companies, families and communities hold special Iftar meals – often in Iftar tents – and you have never seen so much food disappear so quickly. 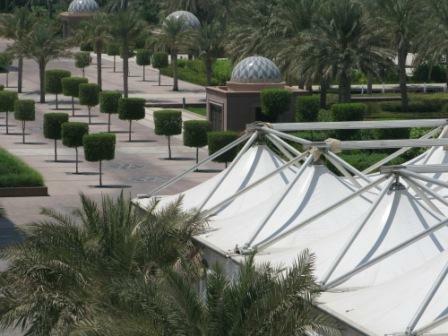 The Iftar tent at the Emirates Palace was set in the gardens, adjacent to the hotel. It was no small affair. The tent sat just a few steps from the shoreline, and the supports and their shadows criss-crossed the broad white tent in patterns above. 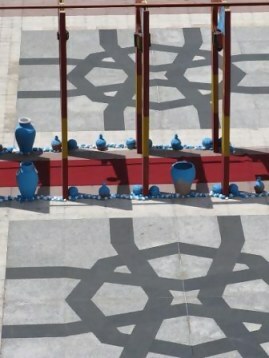 Below, the detail of the entrance walk made its own patterns to add to the art of the whole presentation. 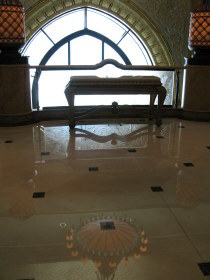 The Emirates Palace is a sort of fairyland for me, with my fascination with reflections. 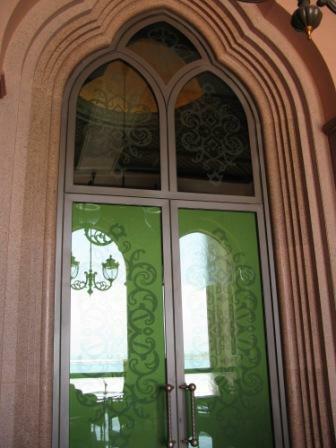 It seemed that each window had been specially designed to capture several facets of the environment rather than just to undertake its main function of maintaining the interior coolness. I cannot imagine how the afternoon tea with gold drizzled chocolates must be… but to be made to feel special, this was a birthday treat that excelled! 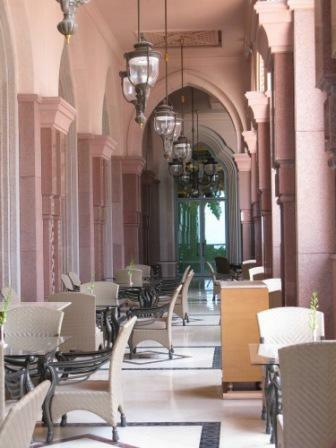 Now the Emirates Palace also serves a Camel Burger as a signature dish: the camel-mince-filled burger is created with local spices and accented with truffle mayonnaise in the folds of a 23 karat gold dusted bun. is the opposite of poverty. It is the opposite of vulgarity.